Tucked away on a bend in the road on North Avenue in Derby is a little biker bar with hands-down some of the best wings I have EVER had. 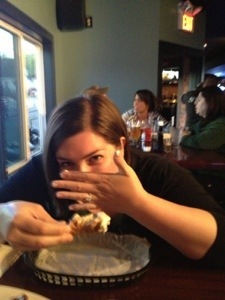 That’s right, I said some of the best wings I have ever had. When my husband came home from Dew Drop Inn a few months ago raving about how amazing the wings are I knew I had to try them. Let’s just say that we now stop by regularly for wings, and when I’m craving wings Dew Drop Inn is my first choice. Everyone always says don’t judge a book by its cover, and Dew Drop is a perfect example of that. From the outside it looks like a dive bar, but on the inside it is clean and cozy. Everyone is so friendly you feel like you’re hanging out with friends having a beer and some wings; that’s how I felt on my very first visit on a crowded Saturday night. Aside from a cool spot to hang out, Dew Drop’s food is amazing! What’s so amazing about their wings? First off, all the flavors I’ve tried so far are spot on. Dew Drop has your standard wings that you would expect such as the honey barbecue wings, which are a must-try! The balance of sweet honey flavor in the barbecue sauce is just right making these wings a standard classic. What I think makes Dew Drop Inn’s wings THE BEST besides their flavor is their quality, consistency (they are ALWAYS good each time I visit), and unique options. How unique are their wing options? 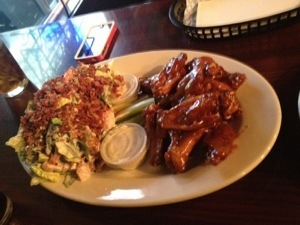 Well, if you’re feeling like trying something a little different you might try the BLT wings. The BLT chicken wings are ranch flavored wings smothered in bacon, lettuce, tomato and very similar in flavor to a traditional BLT without the bread. 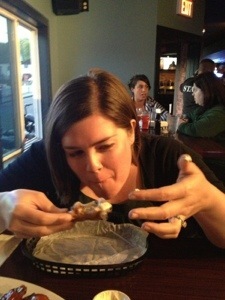 It is a bit of a challenge eating these wings with your hands. You can ask for utensils, but where’s the fun in that? But if you want to try something truly unique, you’ll give the Peanut Butter, Jelly, and Fluff wings (aka PB&J n’Fluff) a try. Peanut butter + grape jelly + marshmallow fluff + chicken wings = an AH-mazing combination you would never expect to go together, but it most certainly does. Seriously. You have to give them a try. When the wings are removed from the fryer they are coated in peanut butter and plated. Next, the jelly is added in what I can only describe as dollops since the entire order is not smothered in jelly. Finally, the fluff is brought with your order in small plastic to-go containers in a serving size comparable to a single serving of salad dressing. Simply dip your wing in the container to add fluff (sometimes I like to spread it on with a knife for more even coverage). The mixtures of flavors from the warm gooey peanut butter combined with the sweetness of the jelly and then the additional sweetness of the fluff compliments the perfectly cooked chicken wings.The fluff takes these wings, which are already so unique, to a level I never thought possible with a chicken wing. 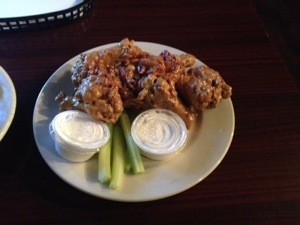 If you like peanut butter, you MUST try these wings. TIP: The trick is to eat these wings while they are hot and the peanut butter remains gooey. I was hesitant at first, but my husband was talking about them for DAYS and he isn’t obsessed with peanut butter the way I am. 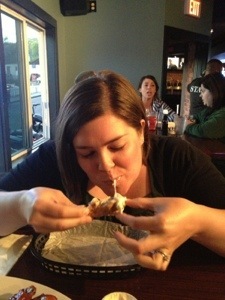 Also, when several waitresses recommended the PB&J n’Fluff wings during my first visit I just knew I had to try them. I cannot forget to add that whenever you go to the Dew Drop Inn the waitresses and staff are all so VERY friendly and helpful no matter if it is crowded or not. Plus the service is as unique as the wing options since you will be helped by multiple wait staff members as needed. What does that mean? It means you’ll be waited on by basically the entire wait staff as all they frequently check on each table. Your food will come out almost as quickly as your order is taken (even when it’s crowded), and you don’t really have to wait for drink refills. Also, don’t hesitate to ask for food recommendations when considering what to order (and try), they are always happy to help and they know what they’re talking about! 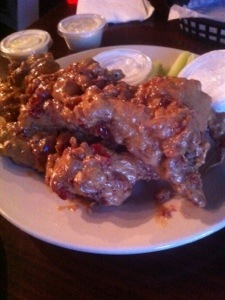 In case I still haven’t convinced you to try these wings, I felt the only other way I could explain to you how unique and so very delicious the PB&J n’Fluff wings are at Dew Drop Inn would be to show you my initial reactions the first time I ordered them. 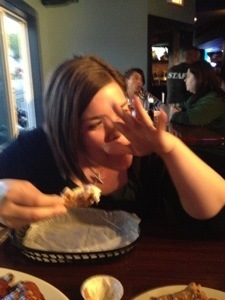 Say hello to the PB&J n’ Fluff wings…annnnddddd my face! Hi guys! After the first bite there is fluff EVERYWHERE! These wings are messy and gooey and you are sure to get the peanut butter, jelly, and fluff all over yourself (I think I even got some in my hair at some point) so just dig in and enjoy! These wings are SO good I am rendered speechless (these pics below are my, “I can’t talk to you right now cause the food is so AH-mazing!” faces)! Other recommendations off the menu? Dew Drop Inn’s food is so delicious, more posts are certainly going to follow as I work my way through the menu, but for now I will leave you with this burger. The Grilled Cheesy Burger. 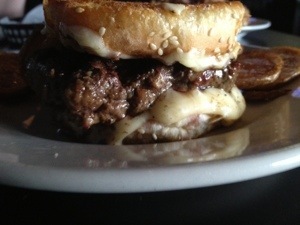 Envision a hamburger surrounded by grilled cheese sandwiches as the bun for this burger. This burger is so good you’ll probably order a second one. 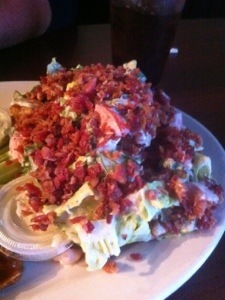 And don’t forget sidekicks for your meal! 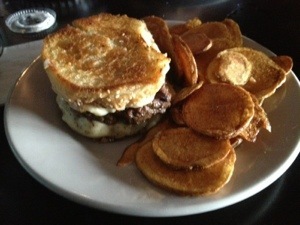 You have the option of frips (pictured above with the burger, which are a combination of potato chips and fries) or tater tots. They have tater tots!! 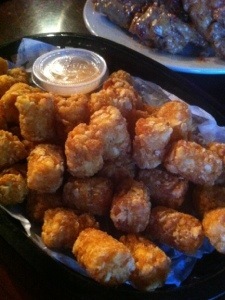 I adore tater tots and if a restaurant has them I’m ordering them. Dew Drop’s tater tots are classic tots served with a tangy southwestern dipping sauce that you will be sure to love. 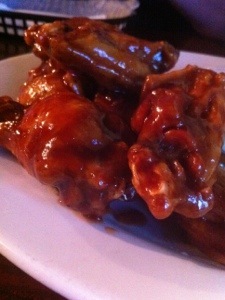 Half Price Wings Mondays (not including the PB&J n’Fluff wings)! Homestyle night is on Tuesdays which features different entrées weekly. Rib Eye Steak night is on Thursdays. 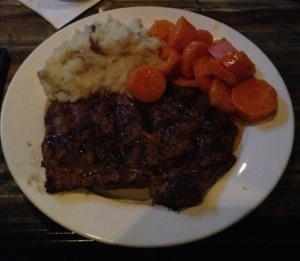 A steak how you like it cooked comes with mashed potatoes and honey glazed carrots for $10.95 (sautéed onions and mushrooms can be added for an additional cost). For more info follow Dew Drop Inn on FaceBook and stay tuned for more posts as I eat my way through their menu which also includes salads, wraps, sandwiches and entrées along with the burgers and wings.